View More In Kids' Bikes & Accessories. The 16" Dynacraft Batman v Superman Boys' Bike is perfect for little guys eager to interact with the greatest matchup of all time. This bright blue Batman v Spiderman bike is bold and young riders will love acting out his own vigilante adventures! 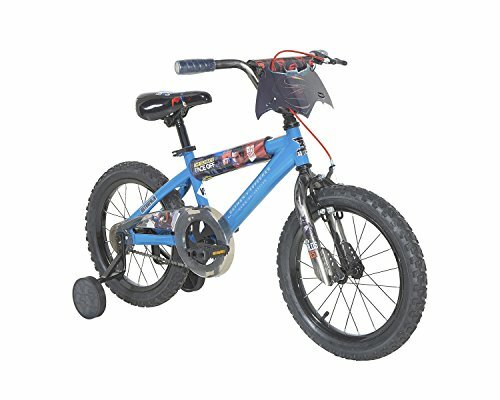 With a sturdy BMX frame and easy-to-use rear coaster and front caliper brakes, the 16" Dynacraft Batman v Superman Boys' Bike is just right for learning how to ride. The adjustable training wheels are easy to remove once he's ready to try riding on two wheels on his own. With a custom Batman v Superman "Dawn of Justice" handlebar shield and graphics, superhero fans will feel like they belong in Metropolis while riding this bike. If you have any questions about this product by Batman vs Superman, contact us by completing and submitting the form below. If you are looking for a specif part number, please include it with your message. 16" Marvel Spider-Man Bike by Huffy, Ages 4-6, Height 42-48"
20" Huffy Jazzmin Girls’ Bike, Ages 5-9, Rider Height 44-56"
20" Huffy So Sweet Girls’ Bike, Ages 5-9, Height 44-56"